Don Milne once here once again, as Roadtrip-'62 ™ wakes up for our thirtieth day of travel along historic US-6. Yesterday, we covered the 210 miles from Imperial, Nebraska to Denver, Colorado. Today, we will not get more than about 20 miles, as we see the sights of Denver and Golden, Colorado. As usual, that means museums, architecture, and we’ll also find a few surprises. But there is so much to see and do in Denver that we can’t get it all done today, even if we limit ourselves to what was here in 1962. Fortunately, I can leave some of it for other roadtrips: see the details below. And if you see anything you like, you should get out on the road and enjoy it in real time. I hope you’re having fun on this virtual roadtrip, I know I am, but there's nothing like the real thing! At any time, click on an underlined word below to learn more about the places on the trip. Let’s get back on the road again! As I mentioned, there is a lot to see and do in Denver and Golden. I first visited Denver in 1977, and again in 1994, and haven’t seen it all yet! So today, I will stick close to our US-6 route and leave other places for those other highways. Other attractions can be seen from future Roadtrip-'62 TM trips down US-85 or US-87, which we met yesterday, or US-36, US-40, or US-287, which we will cross today. Some can be best seen from US-285, which is also in Denver, though we do not meet it. For example, even though both the Denver Museum of Nature & Science (formerly Natural History Museum) and the Denver Zoo were here in 1962, they can best be left to roadtrips on US-40 or US-287, as these attractions lie about 1.5 miles east of downtown and we want to head west. Likewise, Denver Botanic Gardens in Cheesman Park is also to the east of our route and also near US-40 or US-287, so we will skip those. From here, it’s easiest to leave our Impala in a parking garage and walk to our first few sights. First, we walk past Pioneer Monument Fountain at the NW corner of Broadway Street and W. Colfax Avenue. This fountain marks the terminus of the old Smoky Hill Trail, which brought thousands of gold seekers to the area in 1859-60. The statue depicts a buckskin-cloaked, rifle-toting Kit Carson, mounted on his horse and pointing the way west to the promised land, but gazing back towards the east and the civilization he left. It was designed by Frederick MacMonnies and unveiled to the public in 1911. On the rim of the fountain are three reclining bronze figures: The Hunter, The Prospector, and The Pioneer Mother. A plaque memorializing the Smoky Hill Trail was added in 1936 and a plaque honoring pioneer mothers of Colorado was added in 1950. As with other municipal fountains we have seen on our journey, the fountain had fallen into disrepair over the years. It was restored in 1983 and cleaned in 2008, so it is now in excellent condition. Across the street is Civic Center Park, long the heart of Denver's green space. The park has over 25,000 square feet of flowerbeds each summer, serves as a frequent event site, and is ringed by impressive public buildings. The idea for the park originated with former Denver mayor Robert W. Speer in 1904, after he had seen the “City Beautiful” ideas at the 1893 World Columbian Exposition in Chicago. The basic plan included creating a public mall west from the Colorado State Capitol and to group other municipal buildings around a central park area. The plan suffered several setbacks such as lost elections and new landscape planners being hired. Frederick Law Olmsted, Jr., who was developing plans for Denver's mountain parks, and Edward H. Bennett, a protégé of Daniel Burnham, both contributed ideas. Bennett combined ideas from previous plans and added his own, such as the Greek amphitheater and the Colonnade. The park finally opened in 1919. The Denver Art Museum and the Denver Public Library's Central Library are on the parks south side, the Colorado State Capitol sits on the east end of the mall, the City and County Building of Denver is at the west side of the park, and the History Colorado Center is to the south. Over the past few years, $9.5 million of restoration improvements have been made to the Greek Theater, Voorhies Memorial, Broadway Terrace, and various park walkways and balustrades. The Denver Mint is just one block west of Civic Center Park. Because there is just too much to see in one day, I’m going to pick just 2-3 locations to visit. We’re going to visit the Colorado Capitol, the Denver Art Museum, and the Denver Mint. We’ve seen several other state capitols on this trip, at Providence, Rhode Island, Hartford, Connecticut, Des Moines, Iowa, and Lincoln, Nebraska. At Colorado’s Capitol, we become one of about 250,000 annual visitors! A brass disc embedded in the west entry stairway and stamped with “Elevation: 5280 feet, One Mile High, 5-12-69.” notes Denver’s status as the Mile High City, as does the phrase “One Mile Above Sea Level” carved into the 15th step from the bottom. The words on the step were carved in 1947, after several previous markers had been stolen. That is the marker we would have seen in 1962, as the brass disc was added in 1969. There is even a third marker now, another brass disc installed in the 13th step in 2003. The capitol building was built in the 1890's and the dome was plated in 24 karat gold in 1908. I imagine it was local gold. The interior is rare Colorado Rose Onyx, commonly called Beulah Red Marble. Installing and polishing the rose-colored marble took from 1894 to 1900 and consumed the entire known supply of this stone from its only quarry! The exterior is Colorado white granite, with pillars at each entrance supporting a ceramic style roof and topped with carved stone statues. Several different tours are available, including the Dome Tour where you can take in a 360-degree panoramic view of downtown Denver, the Rocky Mountains, and the prairie to the east. The museum in Mr. Brown’s Attic Tour is devoted to Colorado’s history, its legislature, and the construction of the capitol building. The building also houses original paintings of each of the U.S. presidents, and of course you can watch the legislature in action from the House Gallery or the Senate Gallery. These galleries are worth seeing even if you don’t want to watch laws being made: they are decorated with stained glass and brass castings. After the Capitol, we enjoy the flowers as we take a walk across the park to the Denver Mint. The reason there is a mint here is because gold was discovered in Colorado in 1858. The Denver Mint was established by Congress in 1862, so we would have visited in its centenary year. The government bought out a private mint from Clark, Gruber and Company in 1863 instead of starting from scratch. However, the US Government did not begin minting coins until 1906, two years after the present building was completed. Before that, the United States Mint at Denver was only an assay office operated from the Clark, Gruber and Company Bank Building. Miners brought in gold dust and nuggets to be melted, assayed and cast into bars. The government then stamped the bars with their weight and quality. This building was finished in 1904 and is in Italian Renaissance style. In the first year of operation, 1906, the new Mint produced 167,371,035 gold and silver coins valued at $27 million. Today, the output can exceed 50 million coins a day, making the Denver Mint the single largest producer of coins in the world. The free guided tour takes about 45 minutes. As you tour, you may notice the center of the vestibule floor displays the Great Seal of the United States in mosaic. The original seal, a metal casting, had worn so smooth by 1961 that it was replaced with the current seal. The original is now displayed on the wall of the numismatic sales room. Gold bars are on display, weighing about 27½ pounds each, which makes a single bar worth about $376,000. Of course there is a gift shop, where newly minted real coinage, commemorative coins, and silver and gold bullion coins are for sale. Besides U.S. coins, the Denver Mint also once produced coins for foreign countries by contract. But since 1984, the United States has struck coins exclusively for itself. There is no law forbidding the U.S. Mint to produce foreign coins, but demand for U.S. coins has been so great, especially since various commemorative programs have become ongoing projects, that the Mint just doesn’t have the resources to produce foreign coinage. For lunch, I’m driving over to someplace that has been here since 1962 for sure: The Buckhorn Exchange. The Buckhorn Exchange has been located in the city’s oldest neighborhood just five minutes from downtown since 1893. This steakhouse is even a National Historic Landmark! When the restaurant opened, it catered to cattlemen, miners, railroad builders, Indian chiefs, roustabouts, gamblers, and even businessmen. Since those days, all sorts of celebrities have dined here, including five U.S. Presidents. Many have left souvenirs, which are displayed inside, including a 125-piece gun collection. 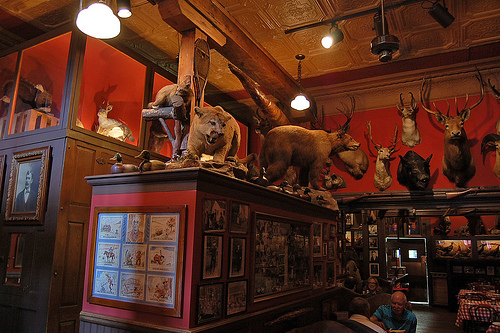 The walls hold a 575-piece taxidermy collection including deer, moose, buffalo, mountain goat, and big horn sheep. The lunch menu includes items like Grandma Fanny’s pot roast sandwich, their famous bean soup, buffalo burgers, bratwurst platters, and an old-fashioned Dutch Lunch derived from Pennsylvania Dutch cooking. I’ll be staring at the taxidermy on the walls while I wait for my order to arrive. After lunch we have to drive back downtown to the Denver Art Museum, one of the largest art museums between Chicago and the West Coast. It contains a collection of over 70,000 works of art in 10 permanent collections including European and American, African, American Indian, Asian, modern and contemporary, pre-Columbian, photography, Spanish Colonial, textile, and western American art. The museum was founded in 1893 as the Denver Artists' Club and has moved many times. This building was its first permanent home, opened in 1949. It has been expanded several times in several different architectural styles including a radical 24-sided, seven-story structure designed by the Italian architect Ponti and opened in 1971. In addition to the exhibits, the museum is home to several artist-in-residence programs, where you can see art in progress. Exhibits change several times a year, so you might find bronze sculptures of the American West with pieces by Frederic Remington, Charles M. Russell, or Hermon Atkins MacNeil. Or you might find the modern iconic artworks of Pablo Picasso, Georgia O’Keeffe, Salvador Dalí, Andy Warhol, or one of Jackson Pollock’s finest drip paintings. I’ll be here for hours. Well, I’m finally through admiring the art, so it’s time to drive west again. Downtown, old US-6 used both Broadway Street and Lincoln Street, as a one-way pair. Both are business streets all the way south to 6th Avenue, with a lot of new construction happening. We head southbound on Broadway Street and soon pass what is obviously a late 1950s motel building, with what looks like a misspelled sign, the Broadway Plaza “METLO.” Actually, it was the Broadway Plaza Motel , built in 1958, but it has now been converted into 27 office suites with four ground floor retail spaces. The new owners restored the brickwork, kept the sign, exterior walkways and staircases, and renamed the complex The Metlo. If we had come in 1962, it would have been nearly new. But by 2011, it had deteriorated to the point of being a rather disgusting home to drugs, bugs, and whores. The recent renovations took the building down to its concrete skeleton, cleaned everything out, and installed lots of new details while keeping the mid-century modern styling in mind. Stop in to have your hair styled or a glass of organic, fresh-squeezed juice. Broadway Plaza Motel, Denver, Colorado, ca. 1962 (Postcard from Cardboard America, used by permission). South of downtown, we turn west onto 8th St as old US-6 heads for the 6th Avenue Freeway. We pass through an older residential neighborhood and single story commercial buildings, finally free of the big buildings near downtown. And the mountains appear again to the west! After 1957, US-6 traveled with US-87, the Valley Highway, all the way to 6th Avenue. In either case, we head west on current US-6 on the 6th Avenue Freeway, which was a freeway already in 1962 for five miles to Wadsworth Boulevard. The first mile to Sheridan Road is typical old freeway construction in a concrete ditch, with very short merge and exit lanes in diamond patterns at closely-spaced interchanges, and narrow one-way frontage roads. 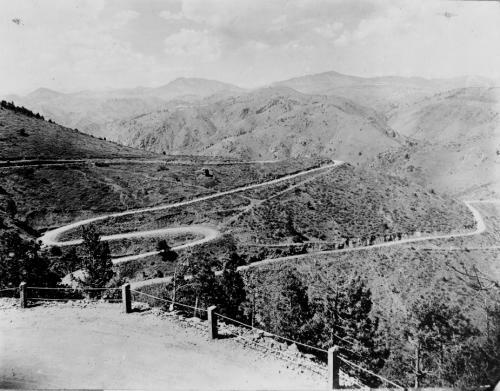 It was a divided highway all the way west to Golden, Colorado, but was later converted to the freeway we drive today, as it was intended to become I-70. That plan didn’t pan out, and I-70 was constructed further north in the metro area. I mentioned US-87 a few times today, and we leave it behind us as we head west. That route runs for just under 2000 miles, from Havre, Montana to Port Lavaca, Texas. It is the third longest north-south US-numbered highway. Back in 1962, you could find the entire route signed as US-87, but as I-25 and I-90 were completed, it was moved onto those freeways. Today, it runs concurrently with those interstate freeways throughout the states of Colorado and Wyoming and into parts of New Mexico and Montana! Another of the Denver sites we won’t have time to see is Elitch Gardens Theme Park. Today’s Elitch Gardens replaces the famous park of the same name, which first opened in 1890. Its history is similar to that of Cedar Point, which we visited on Day 15 of our trip, right down to hosting famous musicians such as Tommy & Jimmy Dorsey, Benny Goodman, and Gene Krupa, and modernizing rides into the early 1960s. But the Elitch Gardens we would have seen in 1962 no longer exists. Most of the site has been redeveloped for condominiums and apartments, though the old carousel building still stands and has even been restored, without the ride. A brand new amusement park was constructed in 1994, located along US-87, so we will leave discussion of the park for that roadtrip. Another of the US-numbered highways we crossed downtown was US-287. This highway is signed in two separate parts, because the portion that would go through Yellowstone National Park is a National Park road and not strictly part of the US highway system. Excluding that road, US-287 runs 1,791 miles from Choteau, Montana to Port Arthur, Texas. The Canada to Gulf Highway Association, which later became the U.S. Highway 287 Association, was active from the 1910s until the 1970s to promote US-287 as a tourist route, and I remember seeing brochures for the association in the early 1970s. And in case any of my readers like to compare my ramblings to maps, you will discover that I am not discussing US-285, even though it appears to end in Denver. That is because we never cross it, as US-285 ends well south of US-6. Before we leave Denver, I should mention some other attractions that we will not visit. I’ve already mentioned several places that I’ll save for other Roadtrip-'62 ™ journeys. But there are also several worthwhile sites are just too new for our 1962 roadtrip. Among these are the Byers-Evans House, which is a museum of the 1912–1924 period including approximately 90% of the original furniture, glassware, china, and other household items that belonged to the Evans family. The Evans family lived there until 1981, so it was not open to the public. Also too new is the Molly Brown House, which I did visit on another trip to Denver. The house belonged to Margaret Tobin (Molly Brown) and tells her story. Like many others, Molly and her husband J. J. Brown became rich on gold mining. Their house has been open as a museum for at least 43 years, but was not back in 1962. The Black American West Museum was opened in 1971, founded to tell the story of “Black Cowboys”. The founder, Paul W. Stewart, grew up in Iowa playing cowboys and Indians with his friends who always made him play an Indian because “there no black cowboys.” Mr. Stewart set out to research the black Western pioneers and cowboys and accumulated an extensive collection that became the nucleus of the museum. The Denver Museum of Miniatures, Dolls and Toys was founded in 1981. They do of course have toys that were popular in 1962, including dolls, Lincoln Logs, Tinker Toys, and an Erector Set. The Denver Firefighters Museum opened in 1980, and the Kirkland Museum of Fine & Decorative Art appears to have opened sometime after the 1981 death of artist Vance Kirkland, whose home and studio comprised the museum’s original location. Today, its 5,000 works are on display in a building completed in 2001. After Sheridan Road, as we enter Lakewood, Colorado, the 6th Avenue Freeway is at grade but narrow and running between concrete sound barrier walls, with frontage roads behind them. The roadside development is mostly residential, but becomes newer and more commercial as we head west. The modern barrier walls eventually disappear and roadside vistas return. The freeway ends where we hit US-40, and we have traffic signals once again as the speed limit drops to just 45mph. Those mountains continue to loom closer, and I can hardly wait to get into them tomorrow. Lakewood is home to another museum too new for our 1962 trip, the Lakewood Heritage Center. The center showcases the history of Lakewood and the changes, inventions and lifestyles of the 20th century. Their 20th Century Emporium Museum Store features unique and retro products of the twentieth century, specializing in cool items from the 1940s through the 1980s, so you might find something period there. The City of Lakewood itself is also too new for our trip; it was not incorporated until 1969. Because it is a relatively new suburb, there was no downtown to drive through on our roadtrip. But there is something old in Lakewood. About 1.5 miles off US-6, on US-40, is Davies Chuck Wagon Diner. The diner opened in 1957 after being moved by railroad from the manufacturer in New Jersey. This place is a true icon of the road, with its giant sign featuring a 17-foot tall cowboy and a fiberglass horse that was installed on the roof in the early 1960s. It also has 1950s style juke boxes on the tables. All the usual diner fare is represented: breakfast, burgers, chili, fountain goodies, and more. If you find the inside too packed with customers, there is an outdoor seating area too. It originally catered mostly to truckers on US-40, which was a major cross-country route. Davies is now on the National Register of Historic Places as a representation of post World War II Americana. We first crossed highway US-40 in downtown Denver and will meet it again near Evergreen, Colorado, where it joins us all the way to Idaho Springs, Colorado. The highway is the offspring of the old National Road, authorized in 1806 by Congress as the first federally funded highway project. The original route ran only from Cumberland, Maryland to Vandalia, Illinois. It was extended many times westward, and when the US numbering system was adopted in 1926, US-40 was applied to the National Road, the former Victory Highway, and extensions that created an ocean to ocean highway from Atlantic City, New Jersey to San Francisco, California. As with many such routes, when the interstate freeway system was constructed between 1964 and 1975, US-40 was functionally replaced by I-80 in the western states. Today it ends in Silver Summit, Utah, though many sections of the original route in California carry Historic US-40 signs, similar to parts of old US-6. In the mid-1950s, the highway carried more automobile traffic than any other transcontinental highway. We would have seen that entire 3228-mile route in 1962. There is just a short rural area between Lakewood and Golden, Colorado, but someday soon Golden will likely become an integral part of the Denver metropolitan area. We roll into Golden too late to see the Colorado School of Mines, so we’ll have to see that tomorrow. Golden began as a mining camp in 1859 during the gold rush. It was the capital of the provisional Territory of Jefferson from 1860 to 1861, and then the capital of the Territory of Colorado from 1862 to 1867. But when Colorado became a state, the capital was moved to Denver. Before we find a place to eat, we just have time to stop by the Buffalo Bill Museum and Grave. The museum is up a long, winding road on Lookout Mountain, just off US-6. William F. Cody, known far and wide as Buffalo Bill, was buried on the mountain by his request in 1917. Johnny Baker, a performer in Buffalo Bill’s shows, opened the Buffalo Bill Memorial Museum near the grave in 1921. In those early years, the artifacts in the museum were items Mr. Baker had collected from the many friends who had performed with him in the Wild West shows. Mrs. Cody was buried next to her husband shortly before the Museum opened and also supplied some of the artifacts. Because the City of Denver owned the property but the Johnny and his wife Olive Baker owned the artifacts and ran the museum and shop, they entered into an operating agreement. Mrs. Baker continued to operate the museum and gift shop until her death in 1956, at which time the City took over operation and ownership of the artifacts. The City of Denver continues to operate the it today so we would have experienced municipal operation both in 1962 and today. Exhibits include information on Buffalo Bill’s life and times, from his early days as a scout and bison hunter to his extravagant Wild West shows that began in 1883 and toured the world. You can see outfits and posters from the shows, Indian artifacts including Chief Sitting Bull’s peace pipe, and plenty of antique firearms. There are even early recordings of Buffalo Bill’s voice introducing his Wild West show in the 1912 performance season. The view from the museum and gravesite takes in both the mountains and the prairie depending on which direction you look. In honor of William F. Cody, Golden hosts Buffalo Bill Days each July. This event dates back to the 1940s when it was merely a trail ride up Lookout Mountain to Buffalo Bill’s grave. It has grown over the years and now includes a modern version of Cody’s Wild West, a parade, mutton bustin’ at the rodeo, music, a classic car show, food and more. As we saw a couple of days ago, for mutton bustin’, kids get dressed up in helmet and vest and hang on to a charging sheep for as long as they can. Back down the mountain; it’s time for dinner. I think I’ll try the Buffalo Rose Bar and Grill, the longest surviving Colorado gold rush-era business. The building was constructed in 1859 and it was first used for a hotel and restaurant in the 1870s, as the Overland House.” Because the territorial council met on the second floor from 1862–1866, many of Colorado’s earliest laws were voted on in this building. Colorado voted for prohibition two years before the rest of the nation, in 1917. The saloon managed to ride out the dry years of no liquor sales by converting to soft drinks, and returned to liquor sales when prohibition was repealed. It has since been remodeled and continues to serve drinks and meals. The Buffalo Rose also offers live music entertainment, both indoors and on the patio. And if the bar scene is not your scene, perhaps you can take in a performance of the Jefferson Symphony Orchestra at the Bunker Auditorium of the Colorado School of Mines. The orchestra has performed since 1953, so we could have seen a performance on our 1962 roadtrip. Where to stay? 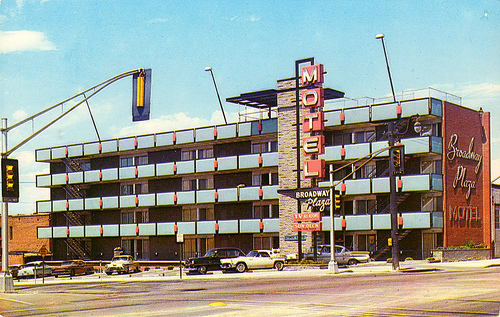 There are a good number of older motels on Colfax Avenue, which is old US-40. They have great names like Bar X Motel, Western Hills Motel, and Trail’s End Motel. But they are all in Lakewood, and too far from here to justify backtracking eight miles. Pleasant Valley Motel is in Golden, but I didn’t find any info on it before the trip. Its address placed it near the Mountain View Motel, which is open and looks older. Perhaps the Pleasant Valley was next door on a now-vacant parcel. So I could stop at the Mountain View then; it looks well kept on the exterior at least, and the outdoor pool even looks OK. The other choices are a couple of newer chain motels or two downtown hotels. Table Mountain Inn is an adobe-style, southwestern décor hotel that looks very new, both in and out, so it may not be suitable. The Golden Hotel is also new, but the location and name evoke a hundred-year old type of city center hotel. It has a beautiful location overlooking Clear Creek and the Rocky Mountains. At any rate, it’s time to stop. But watch the preview of our day tomorrow on Roadtrip-'62 ™ . We will be driving US-6 through Clear Creek Canyon as we pass between real mountains!